If you haven’t heard, no one really cares about anything else but Star Wars these days…and rightfully so. With the success of The Force Awakens and the overall reception to the film, things seem all Summer of 1977 these days. Well maybe not that extreme, but nonetheless the franchise is seeing a peak of excitement rivaled only by the glory days of the original trilogy. Given this, it should be no surprise that the market is seeing a continued upward trajectory along the lunatic fringe that has been representative of the last year. Sellers are selling, buyers are buying, and things are fairly harmonious in the market. As a result, we were able to bring up some great items this month for the MarketWatch. Some of these are appearing for the first time on our little blog given their overall rareness, and some are staples of the hobby that are just great talking points for how the market is shaping up during this post holiday period. It should be noted that the months of January and into early February represent one of the most robust time periods for the hobby on an annual basis. Whether it’s due to some pent up demand of people during the holidays or it’s just a great time of the year for people to clean out their closets, this is one of two golden seasons for collectors, the other being the summer months. So given that we’re in a high point for the hobby and that it’s an "up" season in the year, things have definitely gotten interesting in the past few weeks. Our first two auctions are really two peas in a pod; both unique, both first timers on the MarketWatch and both replacement based. 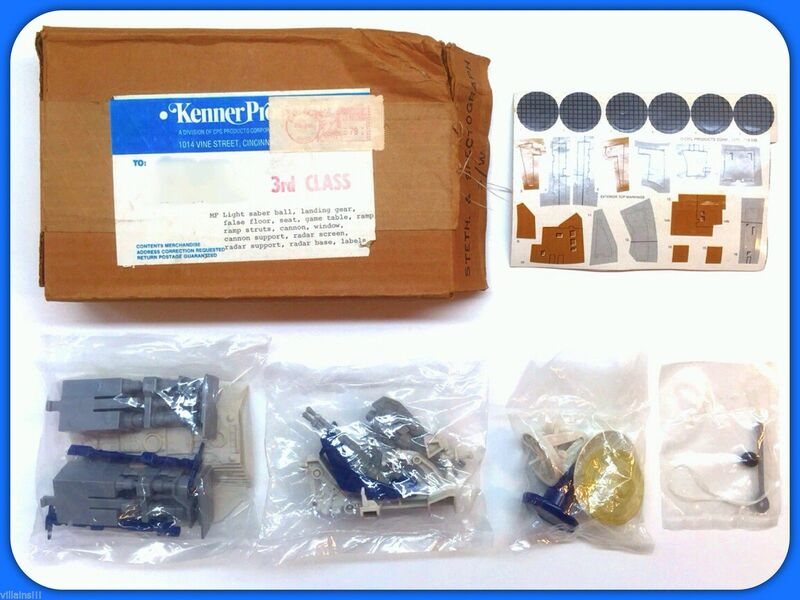 As many know, Kenner set a strong standard in the toy industry via their warranty and repair programs. The company employed a customer service team earlier than most toy manufactures to take care of the ongoing needs of their customers. One way they approached this was by supplying repair and replacement kits in certain situations. Someone would inquire with the company about damaged or missing parts, and Kenner would respond in kind through the mail. 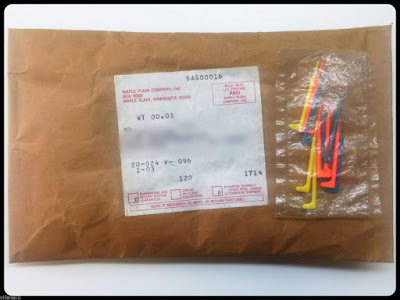 Here we have two great examples still in mailer envelopes from Kenner -- one a replacement parts and decal kit for the Millennium Falcon and the other a bag of lightsabers. The Falcon kit is quite unique in that it has a mix of several parts including: decals, landing struts, ramp, radar dish, guns, and even the force training ball (it seems that even in the early days this was a key part that people needed). This was a great way to get an aging and beaten Falcon back to factory-new condition as we all know the accessories were the first thing to go missing on these beasts. Like the Falcon Care Package, the second item in this duo helped out kids who lost the key accessory for three of the original figures out there: the extending lightsabers for Ben, Luke and Vader. Although I’m not sure what kid had four Vaders, three Lukes and three Ben Kenobis, it’s still a great piece because of the spirit of the item. Who knows, Kenner may have assumed that kids that lost these would probably lose a few more over time. Up next is a grouping of items we talk about somewhat regularly on the MarketWatch: a Revenge of the Jedi proof card. Now there really wasn’t anything particularly interesting about our friend Walrusman that made me include him this month, however he helps spark a dialogue I’ve been meaning to have here for some-time -- that being the explosion in prices of Revenge proof cards. For those that don’t know, this is a small focus of mine in the larger world of being a Return of the Jedi focus collector. I’ve seen these items sell from $50 to $5,000 over the years and what’s interesting about this current day and age is how consistently they sell and the average prices you see on these in a given day. That being said, let’s talk a bit about the current market and try to summarize a few buckets of characters and what they’re realizing in prices. Although the coin “categories” are based on releases, availability and perceived quantities, a 5-tier classification works well for Revenge proofs when looking at them strictly from a price perspective. Tier 1 - $800 and down. These would be the background characters, no speaking parts, not even a growl in most cases. Some of the usual suspects would be the Bespin Guards, Ugnaught, and others that more than likely weren’t going to be voted most popular in high school. Although most proofs in today’s market in this group will sell for close to the $800 mark consistently, there are still the occasions where some of these can be picked up for under $700 as well. Tier 2 - $800-$1,200. This category would include a lot of background characters, but also some main ones as well such as Lando, Chewie, and the alternate outfits for Luke, Han and Leia. Mix in some key characters like the Cantina crew, and the rest of the 2nd release of figures from Star Wars, and you have the largest segment of the tiers encompassing roughly 60% of the proofs in the run. Tier 3 - $1200-$1,800. This segment of proofs includes some of the higher demand characters and some of the unique one off proofs only made in this series. The list includes the original Leia and Han, as these characters will always be in high demand. Others of note in this segment include the "Blank Card," R2-D2 original, Ben Kenobi, and the Rebel Commander. Tier 4 - $1800-$3,000. This segment of the Revenge line includes the same amount of characters as our top tier segment -- two to be specific. Through the years I’ve seen the characters show all kinds of signs of different demand based on the prices they’ve realized, however there have always been four total that bock all other trends in terms of price, the two that are part of this segment include the original Luke Skywalker and Yoda. Both have gone up and down and in some cases over the years you could get one of these characters for as much as many of the other original twelve. However, because of the general popularity they have a tendency to attract a lot more than there peers. 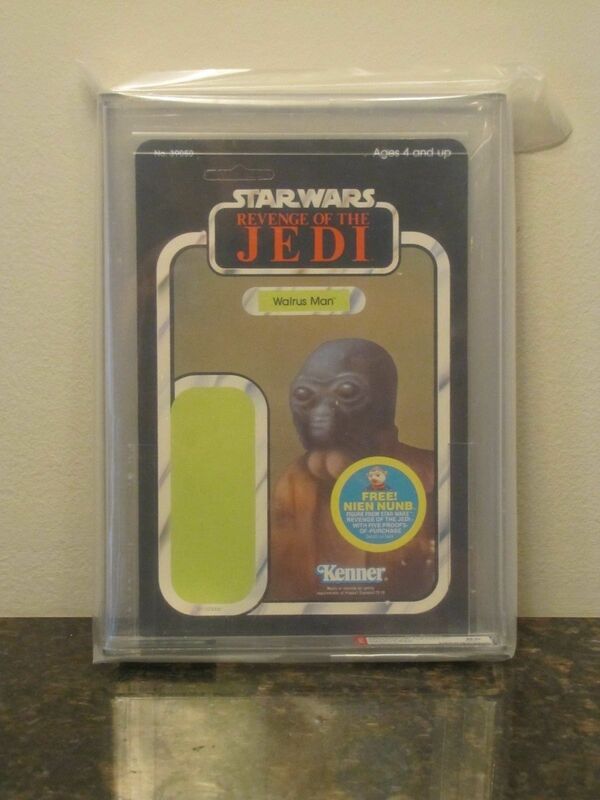 Recent auctions for Luke showed him selling for upwards of $3,000 and in the case of Yoda, $2,000. Thus these two stand alone in a very wide price band. Tier 5 - $3,000 and up. Something about the villains in the Star Wars universe resonates with the fans, and in the case of proof collecting and Star Wars collecting in general there are two names that should literally translate to cash in the Urban Dictionary: Vader and Fett. The two most notorious bad guys in the original trilogy continue to be the most expensive to acquire. Stating a price of $3K and up for these bad boys doesn’t do them justice, specifically in the case of Fett who for years has demanded the $3K mark for collectors looking to get the man in Mandalorian armor. Vader’s high value has been a more recent occurrence, this past year seeing prices that reached this band, but for many years being as attainable as some of the other original 12. Thus in the world of Revenge proofs things continue to look up and up and far away from the $2-300 price points many collectors paid in the late 2000s. In the case of this Walrus Man proof, he actually went for a fairly good price with sellers asking upwards of $1,000 on Facebook for him. One thing I heard a lot about this last year was the number of catalog mailer auctions that I featured. People would say, "Oh well, here’s another MarketWatch with two mailer auctions featured in it," and yes I feature these regularly. Why you may ask? First, because it’s a growing niche in the market. Second, because a lot of these truly are rare in comparison to what we saw on store shelves. And third, they’re freakin cool! So in that fashion here’s two more to look at! 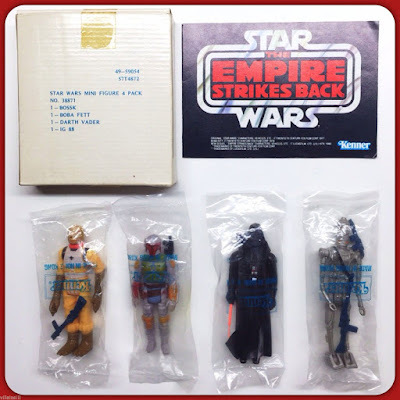 This past month we got a treat with several different mailer auctions including a few 15-packs, some really rare 4-packs from the Jedi line and even some great deals on items from Star Wars. Two that really caught my attention are featured below. The first is the Star Destroyer 4-Pack from The Empire Strikes Back. This is a great collection of villains and one of the most popular catalog mailers from the original trilogy. The price on this one was right on, as it actually turned out there were back-to-back auctions of this pack from one seller. It wasn’t a duplicate as you could see variation from the two sets, however this lead to the market getting two chances at a piece that only comes around once in a while. There was a big increase on both of these in price from the last ones seen during the Summer of 2015, with both of these heading north of $1,500 and the last ones prior to that not even breaking the $1,000 mark. The next mailer is essentially the holy grail for mailer collectors. Although I’ve seen several over the years and no examples of others found in the Kellerman matrix, I still think this particular piece is of grail status in the hobby. The 15-pack line art catalog mailer is essentially a small 1"x3"x5" inch box. It was released fairly widely across several different time periods and retailers. This 2nd cousin of the set fits into a sub segment of catalog mailers with only a few others to be released in a line art box. The line art boxes are collectible by themselves as they are very unique and detailed in a way that no other mailers were. 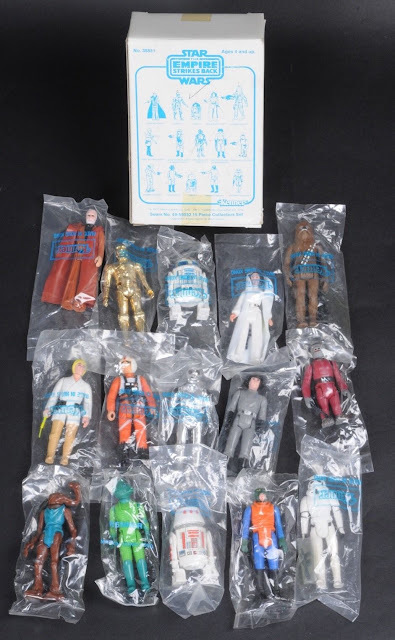 Although this set had several ink marks on the box, it had near perfect figures that were pulled together by a thorough and very bald collecting friend of mine. Without the pen markings this set could have gone over the $5K mark easily, and even with the pen marking it was still very impressive in terms of the dollars it demanded. The last item of our update is truly a sight seldom seen in the hobby. As the hobby has grown so have the tastes of collectors across the board. Those who reached their collecting goals have branched out into other segments like proofs, prototypes, special editions, and foreign items. Our last item encompasses several tangible aspects of all the aforementioned items: for most of us it’s foreign, there were no domestic or European equivalents, and like many items released by Lili Ledy it’s fragile. 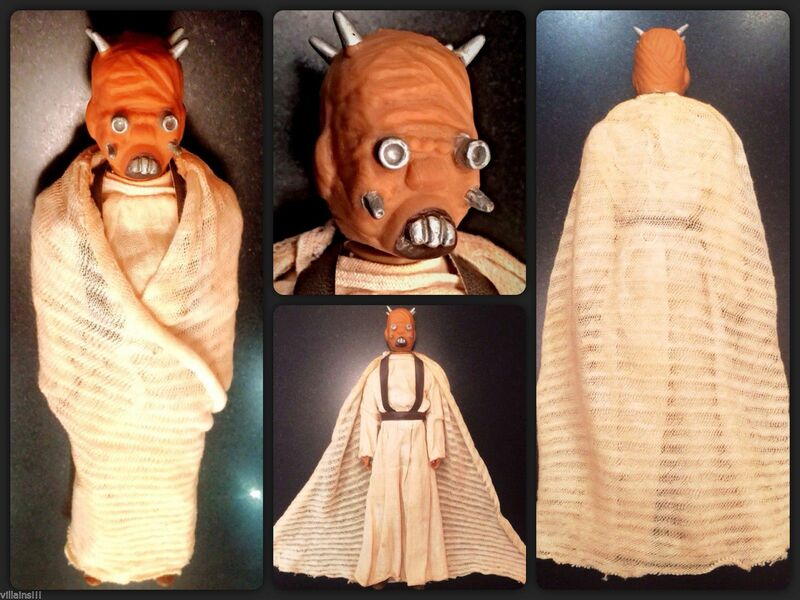 This is the Lili Ledy 12 Inch Tusken Raider from Mexico, complete and in impeccable condition. These figures are extremely hard to come by in general, with incomplete versions selling in the $500-$700 range. To find a complete figure in great condition is a miracle unto itself. As I mentioned, these items are extremely fragile. The bodies of the figures aren’t built like most of the US releases from the 12 inch series. Their heads and limbs have a tendency to pop off and are uniquely built. The accessories are delicate, with the gown and cape being made of extremely light material. Thus it was no surprise to me when this particular item sold for nearly $4,000 dollars, which I personally thought was light given the current market. Something we don’t see often, however more may come out of collections in the coming year given the success of this particular auction. That concludes our coverage for the start of the new year. Check back with us regularly for other updates and look for figure focuses on the TIE Fighter Pilot and others from Brisbane-Brisbane Mike.